Describing a game on iOS as a “point and click” adventure sounds a little counter intuitive, but that’s exactly what Amanita Design has released with their visually stunning “Machinarium” only for the iPad 2 (yes, this is a title exclusive to the newest iPad only apps). Of course, the clicking of old is replaced by simple taps of the finger, and the simplicity of these controls can be both maddening and also a welcome change from swiping ad tilting. In Machinarium, you take control of a little robot who is thrown away and finds himself in the city dump. You must control the robot by tapping on him or dragging particular limbs (or his expandable neck) to various items located in the world around him. This is where the game’s controls become frustrating at times (though in truth I find myself frustrated with point-and-click games more than most people). If you’re uncertain what the robot needs to be interacting with, inevitably you’ll find yourself tapping with frustration all over the screen. 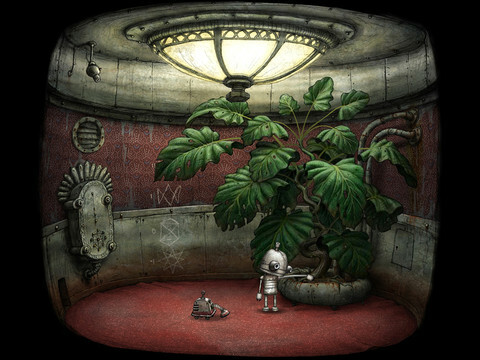 From time to time, however, the game will show a thought bubble above the robot’s head with what item he wants to interact with. This is always a definite help, though the puzzling element of the game is still present. Visually, it’s hard to ask for anything more in an iOS game than what Machinarium presents. 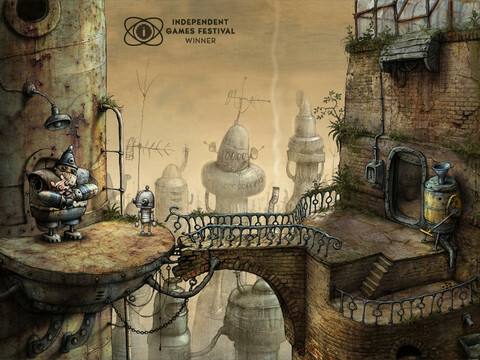 Back in 2009, the PC version of Machinarium won the “Excellence in Visual Art” award at the Independent Game Festival, and the iOS version shines just as brightly as the PC counterpart. Much of the artwork in the game is hand drawn and it may be the only game on your iPad 2 that looks quite like this. With so many games that look similar on the App Store, and the sheer amount of copycat games (how many Angry Birds clones are there now?) a game with totally unique visuals is always a treat to play. Machinarium is hard. I mean it, it won’t hold your hand through the game, and you won’t complete it in an hour. But odds are, you won’t mind the difficulty. Just the emotion and cuteness of the robot, even without dialogue, will make you smile. And quite honestly, some difficulty in an iOS game is a fun change from more arcade type titles that are easy and appeal to everyone. If you’re a fan of point-and-click games, or are just looking for a change of pace in your iOS game rotation, pick up Machinarium only on the iPad 2. It’s available now in the App Store for $4.99. AppSafari review of Machinarium was written by Alex Seiver on September 23rd, 2011 and categorized under Adventure, App Store, Featured, Games, iPad apps, Puzzler. Page viewed 4545 times, 2 so far today. Need help on using these apps? Please read the Help Page.